Known as the target for the overnight rate, the benchmark is what Canada's big banks charge each other for short-term loans. It filters down to consumers, because it affects the rates the banks offer their customers for things like variable rate mortgages and savings accounts. That's already happening, as four of Canada's biggest banks increased their own prime rates by a quarter percentage point on Wednesday. Royal Bank, TD, BMO and CIBC have all raised their prime lending rates from 3.70 to 3.95 per cent. Scotiabank is expected to follow suit soon, but all the new prime rates will be in effect as of Thursday morning. Canada's central bank has kept its interest rate at record lows for several years to stimulate the economy following the economic slowdown of 2008, but has since begun to ratchet it higher as the economy gets back on sounder footing. Economists are expecting a few more rate hikes to come, but the bank hinted on Wednesday that it wants to see how current rates are affecting the economy before proceeding. 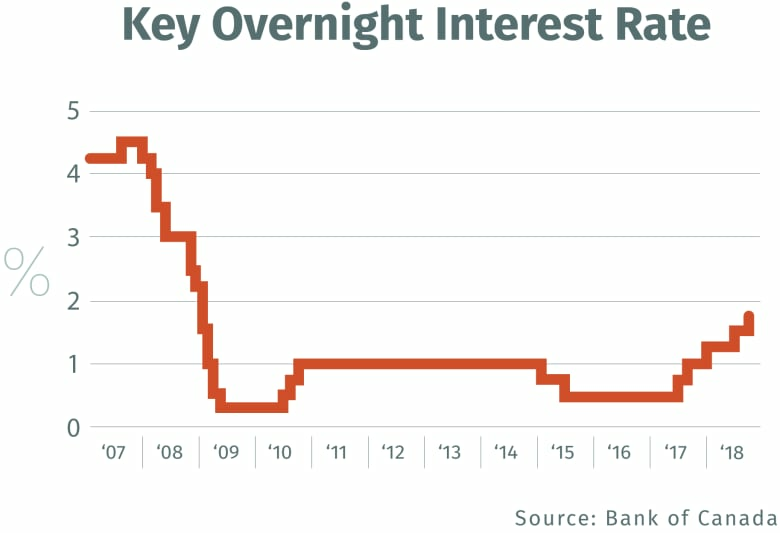 "In determining the appropriate pace of rate increases, [the bank] will continue to take into account how the economy is adjusting to higher interest rates, given the elevated level of household debt," the bank said. In explaining its decision to raise the rate, the bank noted the recently announced free trade deal with the United States and Mexico as a reason for optimism about Canada's economy. The bank also said it expects household spending to increase at "a healthy pace." 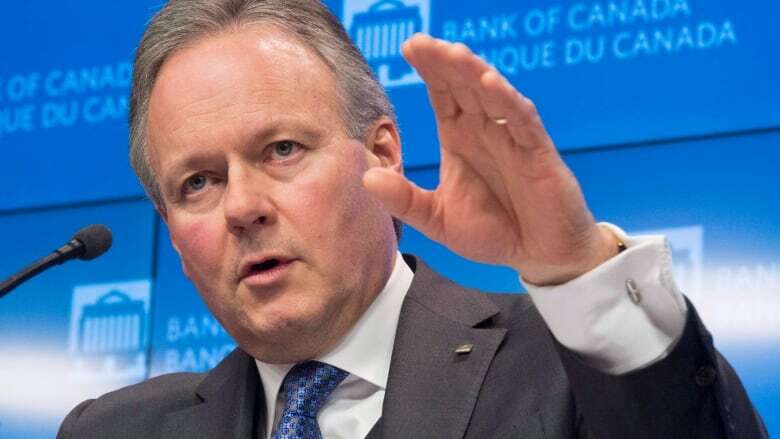 "The reality is that the economy is at its capacity and is no longer needing stimulus," central bank governor Stephen Poloz said at a news conference following the announcement. "And so it's our job to prevent the thing from overheating and creating inflation pressures down the road." Candice Bangsund, a portfolio manager at investment firm Fiera Capital, interpreted the bank's statement as a clear sign it has strong confidence in the outlook for the economy — which means rate hikes to come. "The bank's ... upbeat tone in the statement is not all that surprising given that the economy is operating near full capacity and core inflation is hovering around target, while trade tensions have receded substantially following the successful renegotiation of NAFTA," she said. Economist Brett House at Scotiabank agrees with that assessment, and said he thinks the bank likely won't move to the sidelines until the rate gets to the "neutral" level of about three per cent. "It says not only can you get more rate increases, but they're probably going to happen on a more frequent basis then we've seen in the last year and a half," House said. While that's big news for anyone with a variable rate mortgage to pay off, House said a majority of households won't feel a direct impact because they don't have a mortgage. And for most of those who do have fixed rate ones, that makes them immune to Wednesday's move — for now. 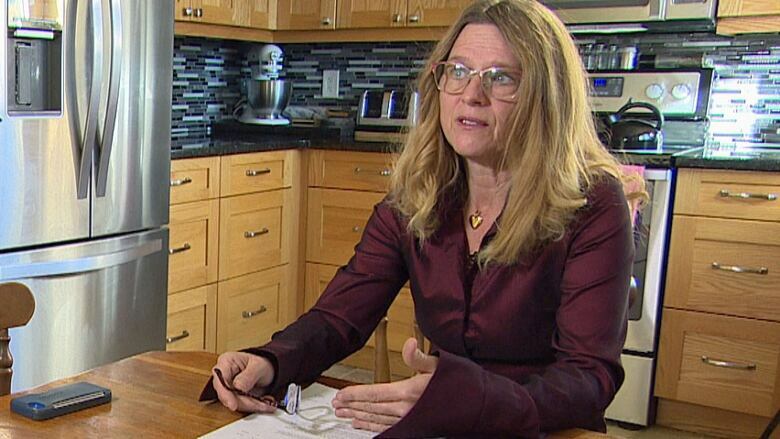 Winnipeg resident Michelle Kennedy is one such person, and the rate hike has her worried about her financial picture down the line. "This is the fifth increase they've had in less than a year so yeah, it's a concern for me," she said. Kennedy bought her house two years ago on a loan with a rate that's fixed at 2.49 per cent for three more years. But she worries about how she'll cover higher payments when it's time to renegotiate. "If that goes up to say six per cent in three years when I renew my mortgage, am I going to be able to afford that?"